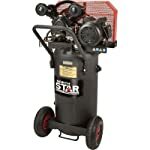 Home » What’s the Best 20 Gallon Air Compressor For Air Tools? What’s the Best 20 Gallon Air Compressor For Air Tools? What is the best 20 gallon air compressor? Well, it depends on what you need it for and what your budget is. We review several of the best 20 gallon air compressors on the market and give you a detailed air compressor buying guide. This guide will answer some of the questions you may have about buying an air compressor, let you know what to look for in features and design elements and provide you with other useful tips and recommendations. We focused on 20 gallon models because these are the most widely used compressors for home DIY projects. They are also affordable and portable, as well as powerful enough to run most pneumatic tools. We reviewed many models available on the market and only 8 match our requirements, all others lacking one essential feature or another. We’ve learned that quiet air compressors, like the California Air Tools 20040DC Ultra Quiet, make most people the happiest. 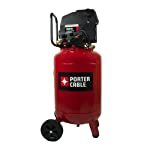 And cheap air compressors, like the Porter Cable PXCMF220VW, are the most popular choices. We hope this guide will help you choose a compressor to suit your needs. But if you don’t have time and just want to see what 20 gallon models are our top picks, then check out our quick comparison table below. When you’re shopping for the best air compressor, it’s important to understand what a compressor is. For the purpose of this article, we describe an air compressor as a type of power tool that is used to pressurize air for the operation of other pneumatic tools such as nail guns, hammers, spray guns, impact wrenches, air drills, paint sprayers, sanders, saws, tire inflators, and many others. However, in fact, you will find air compressors used in many other situations for a wider range of uses. You can find a compressor in a small homemade paintball gun. This homemade gun uses compressed air to shoot balls filled with paint at your opponents (friends). You can find a compressor in many kinds of home appliances such as refrigerators, window air conditioners, wine coolers, pressure washers and even water heaters. And you can also find an air compressor in some pond air pumps that supply oxygen to the water. You probably don’t notice it much, but air compressors are everywhere around us! Is a 20 gallon compressor big enough? We see this question being asked quite a lot. Large air compressors usually range from 60 gallons up to about 100 gallons. So we can see why many people are skeptical about buying a 20 gallon air compressor. What you really need to be asking is what size air compressor do you need to meet the requirements of your air tools and how it can help you get your job done fast. This is going to determine what size air compressor, you need to use. 20 gallon compressors, along with 30 gallon air compressors, are the most popular midsize air compressors that are designed to run most pneumatic tools for home projects. The only difference here is a 30 gallon model holds more air and will allow you to use more air before the pressure drops and the motor kicks on to refill the tank. A 20 gallon air compressor is a perfect choice for painting. Paint sprayers have a pretty low PSI requirement so you can use a 6-gallon air compressor to power them. But since they need compressed air for long period of time, it’s better to use a compressor with a larger tank, probably at least 15 – 20 gallons. Bigger is better! For air-hungry tools like pneumatic impact wrenches or pneumatic orbital sanders, our experience says that a 20 gallon unit isn’t a good partner. For those tools, you’ll need a much larger compressor, probably at least 60 gallon models. We recommend an 80 gallon air compressor if you can afford. 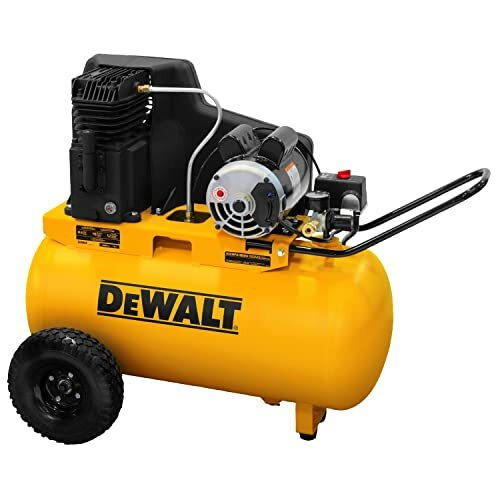 If you’re looking for a compressor to run occasion, low-load air tools such as framing nailers, brad nailers, air drills, staplers and auto tire inflation- then a 20 gallon compressor is for you. CFM (cubic feet per minute) tells you how fast the small air compressor can supply air. And it’s usually the most important number to consider. If a tool uses air faster than the compressor can supply it, you’ll have to stop working and wait for the compressor to catch up. Every manufacturer tests its compressors at 90 psi-an average setting for a nail gun-so you can be confident that you’re comparing apples to apples when you look at CFM numbers. The best 20 gallon compressors we reviewed below range from 4 to 13.7 CFM. 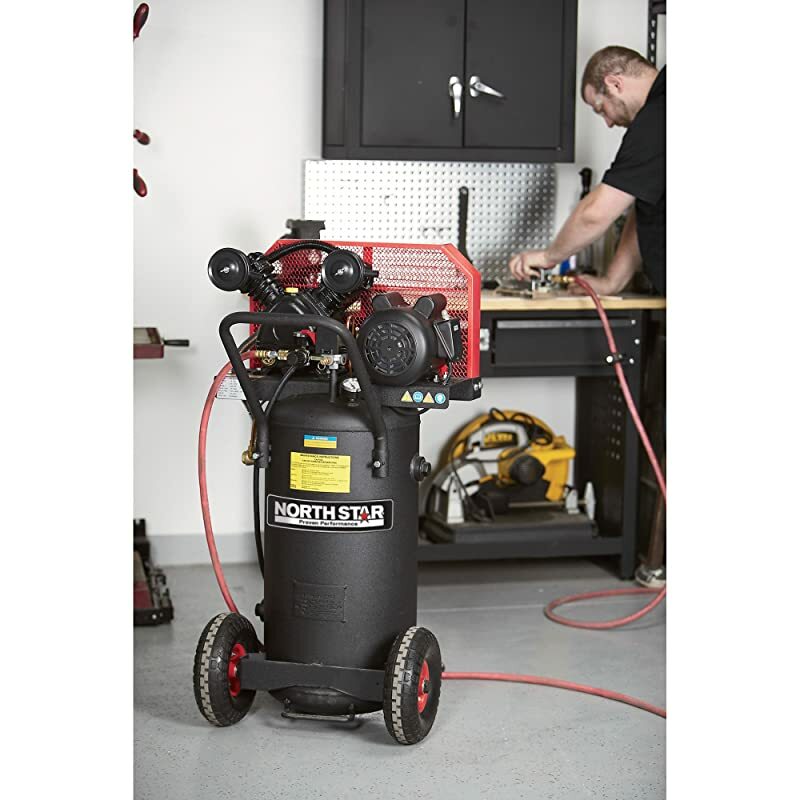 The model that delivers up to 13.7 CPM at 90 PSI is the NorthStar Portable Gas-Powered Air Compressor. This is one of the most powerful 20 gallon air compressors in the industry, which is built for heavy-duty applications. PSI, or pounds per square inch, is the measurement of air pressure and force that is delivered by an air compressor. Most compressors provide plenty of pressure for air tools. In that sense, the PSI isn’t much of an issue. For example, the image above shows a ½” twin hammer impact wrench that requires 90 PSI to run, while most 20 gallon air compressors on the market have a PSI of 120 or more. But a higher max PSI does have one real benefit: It allows a smaller tank to hold more air and perform like a bigger tank. Before buying an air compressor you have to decide whether you’ll be going with a gas or electric model. Gas-powered compressors are the best, or probably the only solution for job sites where there are no electric outlets. They require gas to run and emit fumes, so keep in mind that they cannot be used indoors. Electric air compressors are usually more convenient than gas-powered units if you have electrical power sources close by. They are less expensive and provide much quieter operation than gas compressors. However, electric air compressors are less portable for construction or industrial work and not as good at heavy duty types of jobs as gas compressors. Oil Free or Oil Air Compressor? The most confusing task of selecting the best 20 gallon air compressor is deciding between an oil-free compressor and an oiled one. Air compressors draw air in with a piston. The air is then compressed into a storage tank. For maximum efficiency, the piston chamber needs adequate lubrication, for which oil is used. These are oil air compressors. However, in oil-free compressors, the cylinder is pre-lubricated (mostly with Teflon) for permanent lubrication. The Teflon coating protects the pump. That’s a major difference. While oil compressors need regular oiling, the latter doesn’t require any lubrication. Oil compressors require more maintenance than oil-free ones, but are more durable. As the oil-free compressors are pre-lubricated, there is no constant maintenance and the unit tends to get dry when the Teflon starts wearing out. Oil compressors weigh a lot more and also much more expensive than oil-less ones of the same design. However, oil compressors tend to run cooler and are ideal for long working hours. Moreover, oil air compressors are much less noisy than oil-free ones. If you are going to be using the compressor in a quiet environment, then you surely don’t want a noisy one. The bottom line is to weigh the pros and cons of each type. Oil-free air compressors are cheaper, lighter and require less maintenance – so they are ideal for home use or non-commercial purposes. Oil air compressors are more durable, cooler, and quieter – so they are ideal for industrial purposes and long working hours. 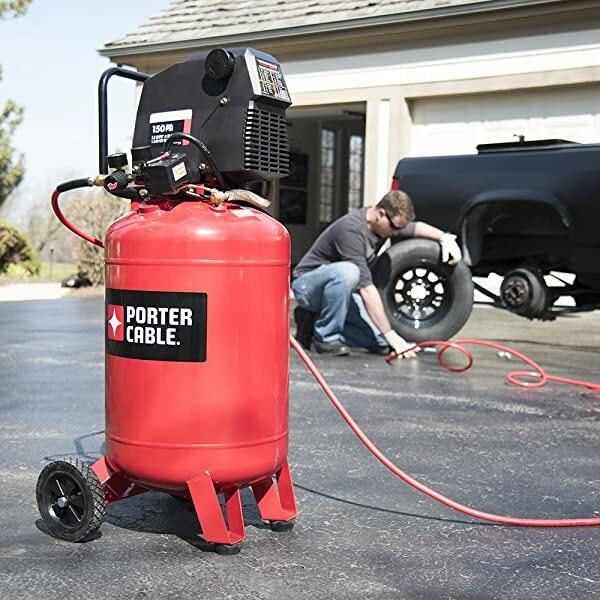 If you decide to go with a 20 gallon oil-lubricated air compressor, then our top pick – the Ingersoll-Rand Garage Mate – may be what you’re looking for. It’s one of the best selling and top rated, as well as the quietest 20 gallon air compressors in the industry. 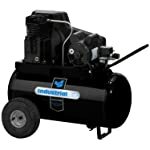 20 gallon air compressors are available in either vertical or horizontal style. Horizontal compressors are somewhat easier to carry around and are more stable, while vertical ones have the added benefit of a small footprint which is good if you are working in small spaces. Having a vertical compressor not only helps in tight spaces, but also ensures stability. All compressors have a motor component that is rated in horsepower (HP). It is a measure of how much load that the motors can perform. It’s common to see manufacturers of air compressors publish horsepower ratings for their products. But does it really matter? Well, NO! When choosing a new compressor, horsepower rating should be the last factor to consider. Pay attention to the CFM rating first and all else second. The best 20 gallon air compressor may not be the right one for you if it doesn’t deliver the CFM you require of it. However, keep in mind that an air compressor with a higher horsepower rating will fill its storage tank faster than others. But it tends to run hotter. To find the right 20 gallon air compressor for your needs, look at its CFM, not its HP. That is the reason why we didn’t show the horsepower rating of any model in our comparison table above. What size generator to run a 20 gallon air compressor? Most 20-gallon air compressors we’ve reviewed draw about 15 amps on 120-Volt household current. Running these compressors off a generator you will need a generator at least 2000 running watts/4000 starting watts for the compressor needs on startup. We recommend using a 3000 running watts/4000 starting watts generator or more to get the best performance. The Ingersoll-Rand Garage Mate is one of the best 20 gallon air compressors ever made. It’s is an awesome unit from US manufacturer Ingersoll Rand. It is portable, but you’ll need some muscle to get the 200 pounds moving in the right direction. And on top of that, you will be shocked at how quiet it is. It really has exceeded our thoughts on the operational noise level. This compressor is designed for professionals and serious do-it-yourselfers who need a continuous-duty compressor that can still run on household current. The single phase, 115V motor will need to be on a 15 amp circuit, but no special plugs or wiring are needed. The compressor provides 5.5 CFM at 90 PSI – enough to power most common air tools for home DIY projects. And, it’s very quiet for an air compressor too. You can work and still hear yourself think, compared to other compressors! The Ingersoll-Rand Garage Mate is one of the best-selling 20 gallon air compressors in the US market. It’s 100% made in the USA with the highest quality, so you know it’s going to last. The only downside of this compressor is that it weighs up to 200 pounds and can’t be converted for 240-volt applications. Overall, we love this compressor. It’s the best 20 gallon air compressor you can buy. It’s an example of why Ingersoll Rand is the world leader in compressor manufacturing. There are several copies of this compressor that are less expensive but they come with cheaper tires and tubes, air filters, pressure regulator and the electric motors are a lot cheaper and weaker too! It’s worth the cash as you will get what you pay for. Contractors need a powerful air power on a job site, often before electricity is available. 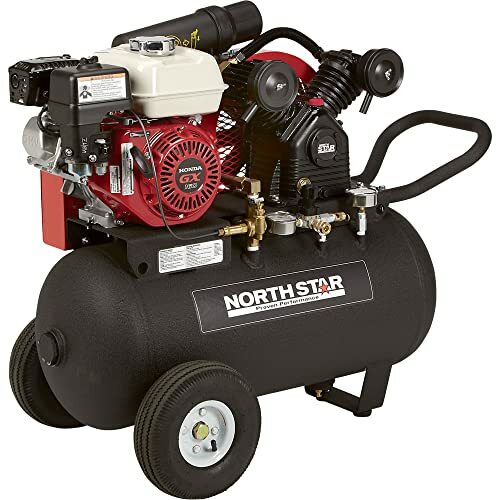 This gas-powered air compressor from NorthStar is built to handle any heavy-duty applications and easy to transport so you can get the job done wherever it’s needed. The best feature of this 20 gallon compressor is a Honda GX160 OHV 5.5 HP engine. This engine is one of the most reliable gas engines in the industry. 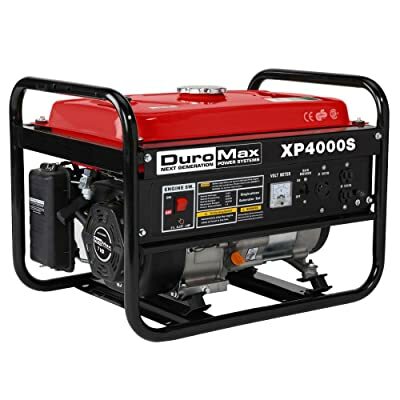 From pressure washers and construction/industrial equipment, to tillers/cultivators, generators, and commercial lawn & garden equipment, this engine has plenty of uses. It draws on decades of Honda engineering with its OHV design, delivering increased efficiency and optimal power transfer for where you need it. Delivers up to 13.7 CFM at 90 PSI, this air compressor is designed to power most common air tools, including ratchets, grinders, drills, nail guns, paint sprayers, and even some orbital sanders. And this air compressor will run most ½” + some ¾” impact wrenches. Furthermore, its 20-gallon storage tank recovers itself super fast to keep you working without interruption. We love this Porter Cable PXCMF220VW because it’s well made, lightweight, portable, and on top of that – it has an amazing price. This inexpensive compressor has everything that you would want in a portable air compressor. First, it features an oil-free induction pump for dependable performance during continuous tool operation. Second, it has 7 in. semi-pneumatic wheels make the unit portable while the narrow horizontal configuration gives the compressor a smaller footprint, enabling it to be stored nicely in a corner taking up less space in your shop or garage. However, this compressor is not powerful as it should be. It only delivers about 4 CFM @ 90 PSI – this is not enough to run the impact wrenches. Most impact wrenches require 3 to 8 average CFM @ 90 PSI, then the compressor should deliver between 4.5 – 12 CFM @ 90 PSI. Overall, if you’re going to be using your compressor for home uses or light-duty applications, consider the Porter Cable PXCMF220VW. It’s one of the best cheap 20 gallon air compressors you can buy. 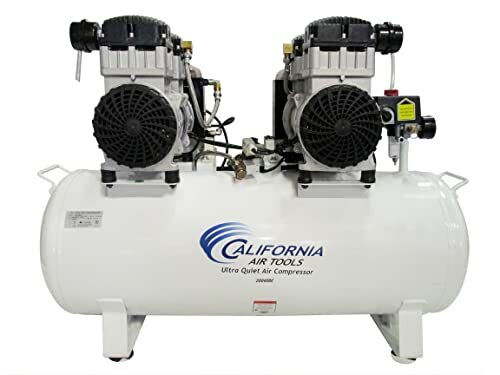 The California Air Tools 20040DC Ultra Quiet is designed to be one of the quietest air compressors in the industry – only 75 decibels of sound. Why is this compressor quieter than most others? Because the manufacturer uses a dual piston motor/pump system that displaces more air more quickly and a 4-pole motor that only operates at 1680 RPM. These two features reduce noise and vibration for a quieter operation. This 20-gallon compressor has been designed to increase duty cycle and allow for longer continuous run times. It has an oil-free dual piston pump designed to have a life cycle before wear of 3000 plus hours compared to other comparable air compressors with life cycles of 1500 hours or less. This air compressor delivers up to 10.6 CFM @ 90 PSI, which is higher than most 20 gallon electric models we reviewed, so it can power just about any air tool. Plus, the compressor takes about 150 seconds to fully pump-up the storage tank from empty. In the end, this is the best quiet 20-gallon compressor currently available. We found that it’s better than the Ingersoll-Rand Garage Mate, but it was too pricey for our top spot. Industrial Air makes some of the best air compressors that come with many good features. This Industrial Air IPA1882054 20-Gallon portable air compressor has a very good quality, provides plenty of compressed air, and relatively quiet. This compressor features a heavy duty induction motor, a thermally-stable cast-iron cylinder body and automotive style ball bearings. 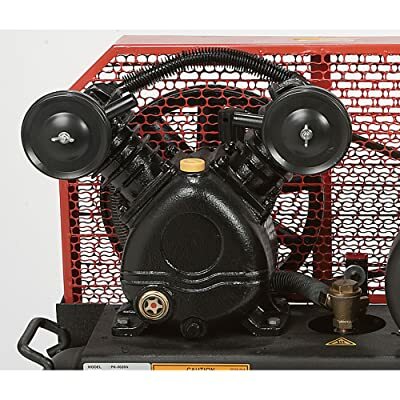 The pump in this air compressor is made from one-piece cast-iron crankcase so it can withstand industrial settings, and can be set up for both 120V and 240V outlets. This air compressor is also equipped pneumatic tires to make transporting it to any site a breeze. We would recommend this model to anyone who is looking for a good quality 20 gallon air compressor, but there is one thing which we really don’t like. One of our friends bought this compressor because he was told it was 100% USA made! But it wasn’t! Only about 85% of the parts were made in the USA and the motor was made in China. On the market, only some models from Ingersoll Rand and Quincy are made in the USA. This air compressor is very good, but it could be better. This is another awesome unit from NorthStar – the NorthStar Single-Stage Portable Electric Air Compressor. It’s well built but it weighs up to 204 pounds. That weight translates into durability, so it’s a good thing. The durable cast iron V-twin pump has oil lubrication and cast iron heads for long service life. Bearings are placed on both ends of the pump’s crankshaft for superior support and less wear and tear. The result is reliable, dependable operation of your NorthStar air compressor, year after year. The single phase, 115V motor will need to be on a 15 amp circuit, but no special plugs or wiring are needed. The compressor can be easily rewired for 230V by a non-qualified electrician. Plus, this oil compressor runs so much quieter than other oil-less compressors. Heat can be a powerful enemy to the longevity of your air compressor pump. That’s why this NorthStar compressor has been engineered with a V-style cylinder orientation to eliminate hot spots and provide consistent cooling, resulting in longer pump life. Copper finned inter- and-after the coolers provide effective heat dissipation and less moisture. The only minor disappointment is the little pressure regulator supplied with the compressor (5 CFM @ 90 PSI) – this is not enough to run your impact wrenches without the pressure rapidly bleeding off. So you will need a bigger air compressor to power heavy-duty air tools like impact wrenches or sanders. 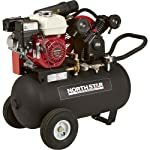 Overall, the NorthStar 20 Gallon Electric Air Compressor is a quiet machine and is one of the best compressors at this size out there for the money. The 4-year warranty and quality build made this a no-brainer! Quincy has been around for a long time – since 1924. With that much practice, like our top pick, you can get really good at building a quality product. 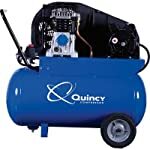 The Quincy Q12120PQ Air Compressor is one of the most reliable air compressors in the industry. Although it only has a 1-year limited warranty, you can expect it to last at least 5 years. The 2HP single-stage motor produces significantly higher CFM per horsepower to deliver more air to get jobs done faster. This compressor generates 7.4 CFM at 90 PSI to operate a wide range of air tools. It is perfect for small shops and devoted home craftspeople. The pump has cast iron cylinder, crankshaft, and valve plate, plus aluminum head for maximum heat dissipation and long life. Unfortunately, this Quincy air compressor is not capable of being wired for 220-volt power. If there are only 220V outlets available in your home, this model isn’t an option. And its price is also slightly higher than other comparable 20 gallon compressors. However, it is relatively quiet, builds pressure quickly, and looks fairly sharp in the shop as well. The bottom line, we have researched all the major air compressor brands in the USA and talked to many friends, Quincy always was at the top of their recommendations, a big plus is that this Quincy air compressor is American made. It deserves to be one of the best 20 gallon air compressors that you can rely on. The DeWalt DXCMPA1982054 Electric Air Compressor is one of the top-rated 20 gallon air compressors on the Amazon. It works well and looks really nice. It’s also quieter and builds pressure much faster than many others at the same price. The low profile frame makes it easy to load and transport, and keeps it stable while you work. 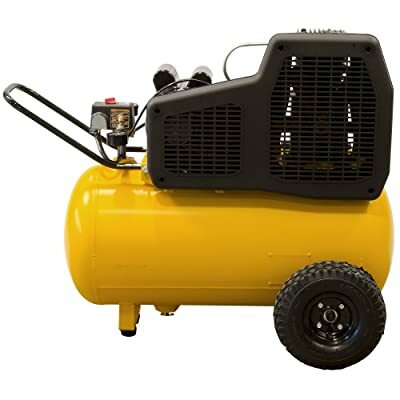 This electric air compressor has a 20 gallons horizontal ASME tank with attached pneumatic tires and a handle for maximum portability on the job site. It is designed to meet the needs of the trim carpenter, remodeler, framer, roofer or flooring professional. With a 1.9 HP motor and an oil-lubricated cast iron cylinder, performance, durability and reliability are built in. The capacity and air delivery give this compressor the ability to support up to four brad or finish nailers or two framing, roofing or flooring nailers at once without compromising performance. Dewalt is a trusted name among professionals. They have provided their high-quality tools to millions of professionals across the USA for nearly 100 years. We can tell you this Dewalt 20 gallon air compressor is one of the toughest compressors in the industry. You can’t go wrong with it!